They won over 30 games, which included a remarkable stretch that saw them go nearly five months without a loss. They topped their conference in the regular season, running away, and they won their conference tournament with ease. They left the NCAA Tournament in the round of 32, losing to an athletically superior team. They didn’t have an especially difficult schedule, especially considering that their conference was substantially down. As a mid major, they managed to become the talk of the tournament, and people really didn’t know how far to pick them to go. Stephen F. Austin accomplished all of these things I listed above; they went 32-3 on the year, and before losing in the NCAA tournament, they had won 29 consecutive games. 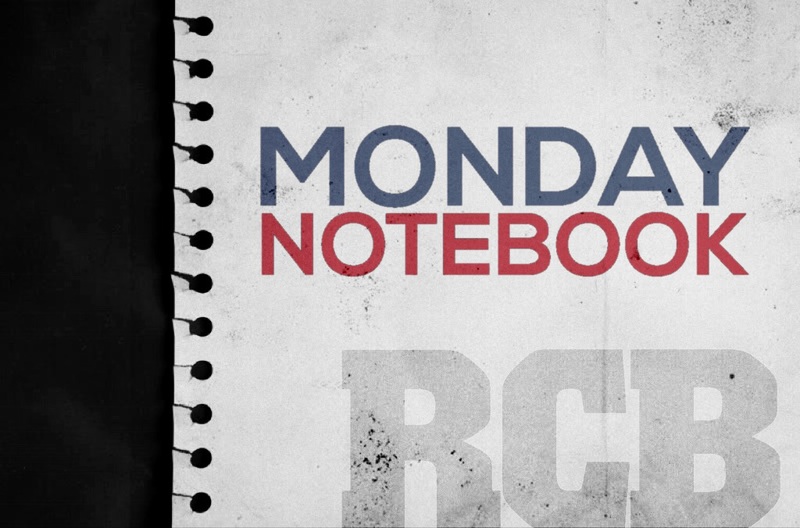 Their only two losses prior to the tournament had come in November, and both were on the road. Sure, they played a weak schedule, but so did Wichita State. In fact, both teams played at least 24 games against teams ranked outside the top 100 RPI (WSU played 24; SFA played 26). Stephen F. Austin beat a better team in the tournament (VCU), and they lost to a higher seed (UCLA), which begs the question: What did Wichita State really accomplish this year? The answer is quite complicated. The first way to look at this season is as a complete disappointment. It may seem brutal or harsh, but that’s what this season was (unless of course you think Wichita State had the purpose of losing early in the NCAA Tournament). Maybe it would be better to say that the season was incomplete, but to me, that would be the same thing as saying it was disappointing. The expectations may not have been there at the beginning of the year, but once Wichita State won 30 games in a row, the expectations changed… big time. In 2010, KU was in a similar position. They had won 19 of their last 20 games, and they were given a one-seed heading into the NCAA Tournament. 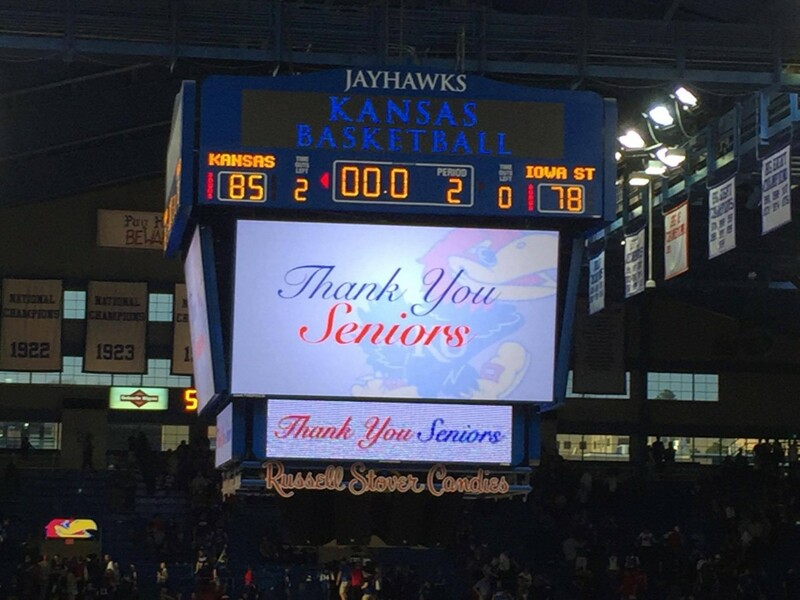 After dominating the 16-seed (Lehigh) by 26 points, KU matched up against Northern Iowa. I’m not going to rehash all the details of that season, but KU lost that game, and nobody… and I mean NOBODY… considers that season a success. If Shocker-nation and Wichita State want to be considered anything more than a fluky team with a short burst of success, they are in a similar boat. What will be remembered this year about Wichita State? They won a title in the way-down Missouri-Valley Conference. Big deal. Their fans will remember the winning streak, but does anyone remember that Butler won 24 games in a row a few years back? No. All anyone remembers is that they got to the finals against Duke. Anyone remember that Missouri opened the 2011-2012 season winning 14-straight games? No. 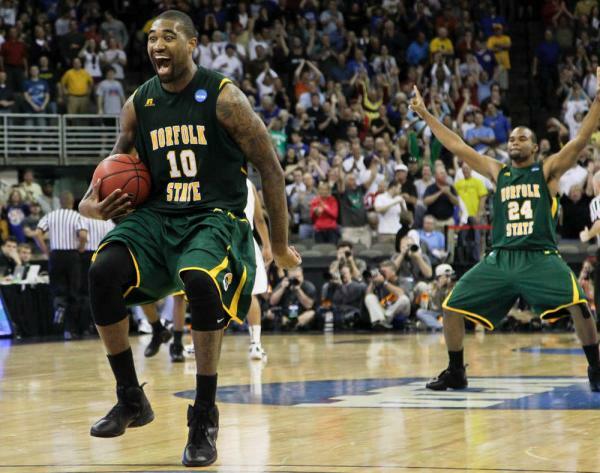 All anyone remembers is Kyle O’Quinn throwing the ball up in the air after 15-seed Norfolk State upset the Tigers. The Shockers had the longest winning streak to start a season in NCAA history, but that record will eventually be broken. Florida only lost two games this year, and both games were on the road to against ranked teams, by a combined seven points. If they played the joke of a schedule Wichita State played, they wouldn’t have come near a loss. Records were made to be broken. History is written by the victors. The second way to look at this Wichita State run is in a two year burst. I’d compare their success to the short-term success of Florida Gulf Coast University, albeit Wichita State obviously accomplished far more. After reaching the Sweet 16, “Dunk City” saw a large spike in enrollment, as applications increased by more than 35% (which is not unprecedented considering that George Mason and Butler saw similar spikes in enrollment following successful NCAA tournament runs). The president of Florida Gulf Coast University, Wilson Bradshaw, even admitted that the “visibility in basketball certainly didn’t hurt,” as it likely accounted for most (if not all) of the change. All of a sudden, FGCU was on the map, and Andy Enfield, their head coach, was getting offers from around the country. Even after Enfield left for USC, the Eagles were in great shape. Florida Gulf Coast practically had its pick of any assistant in the country to take over the coaching job; after all, who wouldn’t want to coach “Dunk City?” Just a few weeks later, a big name Kansas-assistant by the name of Joe Dooley was heading to Fort Myers, and the Eagles haven’t looked back. I believe Shaka Smart made a mistake by staying at VCU; I don’t believe Greg Marshall will make that same mistake. After leading this improbable two-year run, Greg Marshall has officially become the next big thing. Marshall will likely leave for a larger program (Oklahoma State is an interesting one to watch), because quite frankly he is better than what the coach of Wichita State should be. He is above Wichita State. When Marshall leaves, there will be a good replacement, and that is largely a function of the school’s brief success. Is that fair? Probably not, but neither is life. Two years of success is all it takes to see a large boost in recruiting, and hundreds of thousands of fans have hopped on the Wichita State bandwagon, so why wouldn’t an assistant or lower level coach want to take over that job? Unless being able to out-recruit a weak conference and make the NCAA Tournament every year is a problem, there really isn’t a downside to starting your career at Wichita State. It’s a great jumping off point. Ultimately, when you look at this 2013-2014 Wichita State team, the legacy that will be left will mostly benefit the program. This year was a disappointment for Wichita State, who ended losing to a decent Kentucky team that lacked experience and chemistry. They lost to a Kentucky team that shot 32.9% from three and was 115th in the country in field goal percentage. They lost to a Kentucky team that was 312th in steals per game. They lost to a Kentucky team that lost to Arkansas (twice), South Carolina, and LSU. They lost the last game of the season. Wichita State 2013-2014… They lost. Wow. I am a KU fan but give credit where credit is due. WSU played a great game yesterday. Which is more that I can say for KU. Going undefeated in any sport at any level is something. I don’t care if you are in high school. KU had the most talent but had lost 4 games late in the season. WSU almost defeated a team loads with talent and mostly all-American players. You can trash Kentucky but they have played better late in the season, unlike KU. If this makes you feel better well go for it. 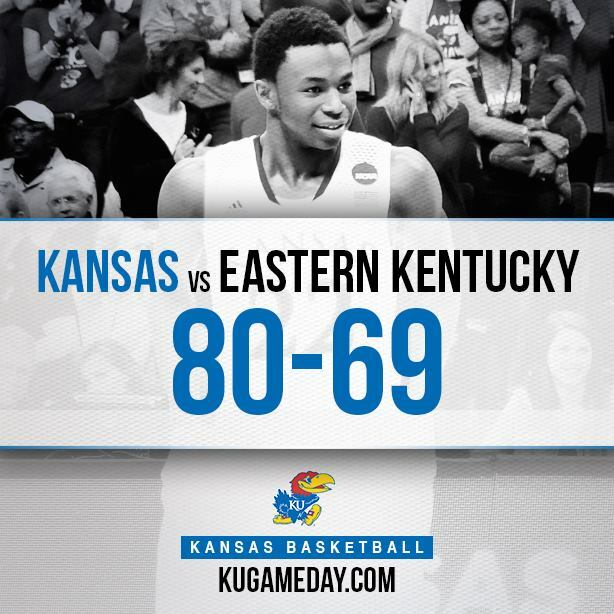 Did I say KU loss to mediocre teams. Don’t be a hater. No I completely agree with this, they lost to the first good team they played against, they really proved nothing this year. If they would have won this game and lost to Louisville it would be a different story but that’s how it ended. I agree Lilido in that I think we should give WSU more respect for the way they played in that awesome game vs Kentucky! WSU played as a team, played good defense, showed a lot of fight and heart. So, even as a KU alum and lifelong Jayhawk, I thought they deserve more credit for the way they played from the opening tip until the final buzzer. (Too bad a wide open and hot-handed Early didn’t take the final shot). I wish KU had played that way, but it’s not comparable when you lose one of your top players. 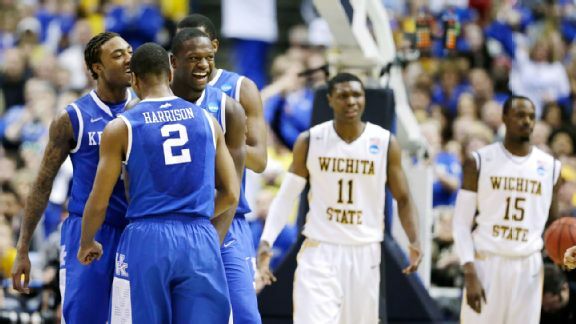 However, I will say this, that WSU vs Kentucky game also proved a point about WSU’s undefeated season. WSU is a very good team in a very weak conference- that is just a fact. If they were to play top-ranked teams in the non-conference portion of their schedule (I don’t want to hear excuses, just get it scheduled) or if they played in a tougher conference, there is no way they would be undefeated. Just the facts. You put WSU in the Big 12, SEC, ACC, or Big East and they would definitely have at least one loss. So, while I applaud their talent and effort in the game versus UK, I take their undefeated season with a grain of salt. You put the top ranked teams in the nation in the Missouri Valley Conference and they would be undefeated as well. So, how special was their season really? Great Comment Lady J. However, I will point out that WSU had a non conference strength of schedule ranking 29th by ESPN RPI. That would succeed the majority of the “Power 6 conference” schools. Idk what they can do about their conference, though. Teams like UK and KU won’t play them. Their best shot was to play Texas in the CBI tournament in Kansas City, but Texas lost to BYU, preventing the eventual matchup. Their excuses are valid, but 29th out of conference SOS is not bad, they just need a new conference. And no, they probably would not have gone undefeated in a POWER 6 conference, but there is a reason that a team hasn’t reached the tournament undefeated in over 20 years… IT’s EXTREMELY HARD TO DO. There’s no reason for KU, UK, Michigan State, or any elite program to play a school love WSU unless they want to do a neutral site or if WSU goes away to Allen FH or to Rupp Arena. I’ve read that Marshall likes to complain about no one wanting to play his team, but the other coaches have all said he’s either never contacted them or wanted them to come to WSU for the game- why would they do that? They would end up losing revenue big-time by playing at WSU. I’ve seen WSU’s non-conference schedule- it’s not impressive at all whatsoever even ranked at 29th. So once again my main point is yes it is hard as hell to remain undefeated all season but when your a strong program in a weak conference it makes it a heck of a lot easier! Ask Arizona and Syracuse about that… When is the last time a team went undefeated in a “power” conference? **crickets** Exactly! I would argue that WSU has a history of a stronger program than a two year wonder. Turgeon wouldn’t have been able to leave otherwise. Granted, the consistency may be something left to be desired, but it shouldn’t be discounted. WSU hasn’t come out of nowhere like FGCU. I believe that with the recent success, they will continue to recruit iat a higher level and will have the advantage of more mature players. Losing Creighton killed the league and unless the league or WSU change,they can’t do much about that. While I appreciate your point that if the tournament is the main (perhaps sole) measurement of accomplishment for a team, the only thing they garnered was a number 1 seed. However, the attempt to paint the program as a flash in the pan is a little short sighted, in my opinion.